Naturally Addictive without MSG! 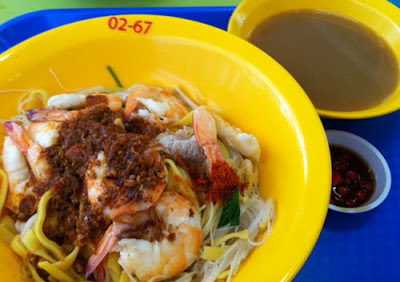 At S$5 or $7, you get a healthy bowl of prawn mee without feeling thirsty or numbness on the mouth. Prawns are fresh! Opening hours: 8.30am - 3pm. Closed on Thursday. Blk 120 Bukit Merah Lane 1 #01-58 Alexandra Village Singapore 150120. Traditional local recipe since 1943. 1. Prawn Mee Soup – The gold is in the soup! 2. Curry powder – They fried and grind the curry powder. Just right without being too peppery. 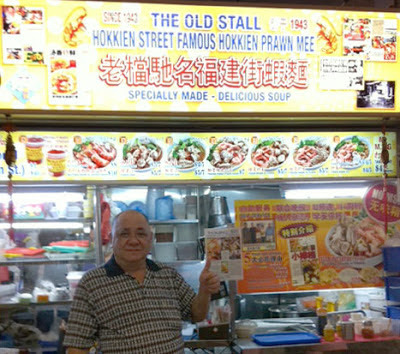 They only serve with thick yellow noodles, kway teow or mee hoon. No mee kia or mee poh. "To all those attention seeking fuckers out there, we are also human. I am a NSF who ORD's in 5 months and about 3 weeks ago I was taking the Circle line MRT back from a long days work in camp. And in the entire train, there were only about 10 people including me. It was EMPTY!!! so I decided to sit down with the impression that if there are no more seats available and someone is in need of it, I will get up. But this was highly unlikely because I was nearly to my stop and the train was only filled with 10 people. So what happens is that this woman steps into the train and sees me sitting. She approaches me and says ""excuse me, may I please sit down on your seat?"" Astonished, I look around for one second and just get up to avoid any Drama whatever because I represent the SAF. So I walk to another seat in the train and sit. She comes to me and tells me to get up because I am in the army and am not allowed to sit down. I told her that if someone needs a seat i will give it to them (in a very nice manner) and also said that the entire train is empty. She then says that she will take a photo of me and post it on STOMP and all that nonsense because i am a army personnel and im not allowed to sit. I was very angry that many people have this mentality, but because I didn't want any drama to go down, i just said sorry and stood the rest of the journey. And this was not a short journey it was a long one as she apparently had to go out on the same station i did. I know i should have let her take the photo, but i really was not up for all the drama. All i have to say is that to anyone who sees any military personnel on the mrt/bus etc sitting down. Please dont be a prick if the entire place is empty. I understand if it is full, i would voluntarily give my seat to someone else (in fact, i have done this in many occasions even when im not in uniform, and even before i enlisted) So to all those attention seeking fuckers out there. STOP WE ARE HUMAN TOO. WE NEED TO SIT..."
Seats are meant for those who need it. One day if my high heels are killing me with blisters, I would need a seat too. Anyone who pays for the ticket will have the right to take an empty seat. I will be sad to be denied of a seat simply because of what I'm wearing or what I am. I hope people will be more gracious and less uptight about "what should" and "what should not". Sometime ago, I offered my seat to an elderly man but he politely declined. So I went back to my seat. I will not insist that he take my seat simply because of his head of white hair. If someone were to take a photo of me on my seat with the elderly man standing besides me, it would be malicious. As a singles event planner, whenever I meet parents with adult singles children, they would not hesitate to share with me 3 common things. 1. How worried they are over the future of their middle aged kids and how they wish their children would be able to find someone to take care of each other. 2. How their kids seems too busy or disinterested to look for a life partner, even though they have the intention to settle down. 3. How they wish their children would be more proactive in their search for a life partner. Their children are usually white collar workers with established careers. They spend a lot of time at work and taking care of their parents. They are confident, filial and wonderful people, but just lack the opportunities, time and energy to meet other singles. Most of these parents are retired and have more time on their hands. They wish to do something positive to help their children suss out compatible friends. My company– Clique Wise has conducted 3 Parental Matchmaking/Parental Connections sessions so far. 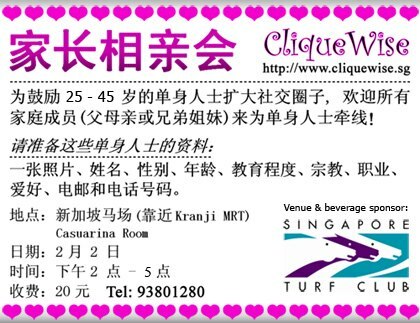 The most recent one was held at the Singapore Turf Club on 2 Feb 2013. Parental Connections/Parental Matchmaking is a session for family members to network with each other, and exchange details of their single children. 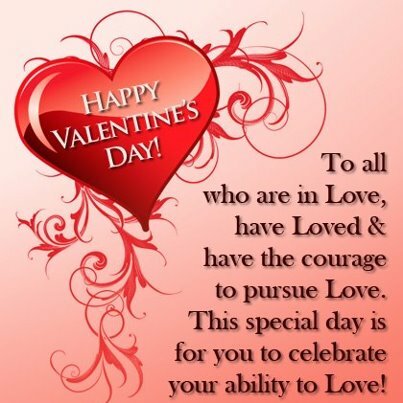 It is up to the singles to follow up and develop the relationship from there. To increase the likelihood of finding a good match for singles, family members are encouraged to provide as much information about their single children as possible. Every event, parents would thank us sincerely for running the Parental Connections. They are grateful that they could do something for their children's happiness through our events. These parents simply wish happiness for their beloved kids. Some children prepared a neat resume for their parents to attend this session. I'm especially delighted to see parents attending this session with their single children. It shows that they have very close kinships. They value each other's opinion in the search for life partner. 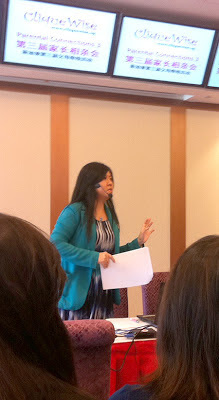 During the last 2 Parental Matchmaking, I gave a short seminar to manage the expectation of the parents on these sessions. I shared that the objective of these networking events is to assist the singles to enlarge their social circle, not for parents to find their preferred daughter-in-law or son-in-law. Ultimately, the singles are the ones who make the chemistry sizzle and the commitment to be together. I also touched on tips to enhance relationship between parents and adult children. We sincerely hope the singles children will be more open-minded to meet new friends and proactive to follow up with one other after these sessions. Why waste the kind efforts of the elders? If friendship blossoms to marriage, it's a bonus! If not, they gain new friends!